"Thinly sliced beef in a rich creamy sour cream sauce. 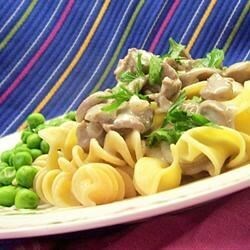 This recipe is how Count Stroganoff intended the dish to be made!" Melt butter in a large saucepan over medium-high heat. Stir in onions and garlic, and cook until slightly tender. Mix in mushrooms, and continue cooking 2 minutes. Place steak strips in saucepan and cook about 1 minute. Mix in consomme, Burgundy and lemon juice. Bring to a boil. Added 1 tbls dijon mustard for extra flavor. Delicious and easy! !